They're not very entertaining. They don't do much but sit there, stuck to something. In fact, asset tags must be the most boring things on earth! But asset tags lead extraordinary lives. Often passive passengers on a high-energy roller-coaster ride, they witness damage and destruction, creative construction, theft and recovery. Asset tags are present when entrepreneurs envision business empires, brilliant minds compose symphonies or design sophisticated machinery, and hard-working professionals tear up the asphalt with a jackhammer. Asset tags are often attached to high-end workstations, heavy-duty construction equipment, vehicles, desks and other assets of all sorts. They stay or go as needed — to the moon or the bottom of the ocean, on a missile rocketing towards detonation or attached to medical equipment saving a life. They might endure wretched conditions in the rugged outdoors or permanent bliss in an air-conditioned office. They fly out to job sites and return with the dirt, sweat and grime of a hard day's work to deliver a perfect read from the resident barcode scanner. They ensure that valued assets receive the attention and care they merit. Asset tags get scraped up and ground down. They get scalded and sunburned, weathered away or seared by harsh chemicals. Yet they endure years of this brutal treatment with stunning durability. In the darkness they lurk until in a ray of light they shine forth like a badge of pride. With honor they're entrusted with the company name and the special number of the property they protect. Their mere presence elicits respect, often deterring thieves and vandals. Company managers, police and agencies look to asset tags for vital information. When the property is returned to its rightful owner, a scan of the asset tag is often top priority. Ah, but asset tags have much to say! They just require coaxing from an asset management system and gentle nudging from a barcode scanner to speak volumes about the property they represent — places a tool has gone and the work it has done and when it was serviced. They divulge parts and warranty information and component specifications. Through asset tag the sum total of data about an important piece of capital is available in the blink of an eye. 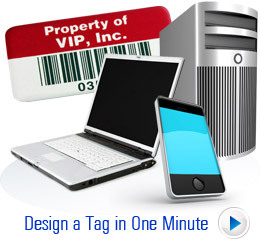 Asset tags provide an incredibly valuable service for a minimal cost.